China has offered Nigeria a loan worth $6bn to fund infrastructure projects, the Nigerian foreign minister said on Tuesday. The announcement came as both countries signed a currency swap deal to boost trade. Nigeria has been in talks with China on an infrastructure loan for months. Lin Songtian, director general of the Chinese foreign ministry’s African affairs department, had earlier said Nigeria would be able to benefit from a $55bn package for Africa, which mostly consists of concessional grants or export lines. The Industrial and Commercial Bank of China Ltd (ICBC), the world’s biggest lender, and Nigeria’s central bank also signed a deal on yuan transactions. “It means that the renminbi (yuan) is free to flow among different banks in Nigeria, and the renminbi has been included in the foreign exchange reserves of Nigeria,” Lin said. Nigeria had said it was looking at panda bonds – yuan-denominated bonds sold by overseas entities on the mainland – to fund the deficit, saying they that would be cheaper than Eurobonds. Nigeria’s central bank has said it plans to diversify its foreign exchange reserves away from the dollar by switching some into yuan. It converted up to a tenth of its reserves into yuan five years ago. Lin said a framework on currency swaps has been agreed with Nigeria, making it easier to settle trade deals in yuan. China has signed similar swap agreements with countries ranging from Kazakhstan to Argentina to promote wider use of its yuan. Beijing also signed agreements to develop infrastructure in Nigeria, part of a drive to deepen its ties with Africa. ICBC agreed a $2bn loan to Dangote, the company owned by Africa’s richest man, Aliko Dangote, to fund two cement plants it plans, he told Reuters. 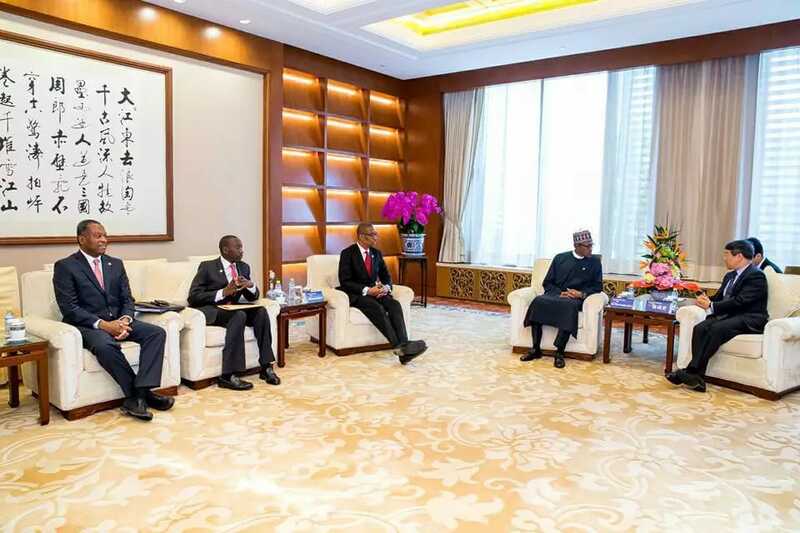 China’s Xi told Buhari there was huge potential for economic cooperation in areas like oil refining and mining, according to Xinhua, China’s official news agency. In a speech to business leaders, Buhari said both countries wanted to work together in agriculture, fishing and the manufacturing of cars, construction materials and textiles.